Shaping the shooting world for more than two centuries, Remington is one of the most respected names in the industry. Remington has designed some of the most legendary and iconic firearms in the world. The company brings the same level of excellence to their Premier Core-Lokt Ultra ammunition. Delivering pin-point accuracy and unparalleled on-game reliability, Premier Core-Lokt Ultra performs with precision from point blank to 500 yards. 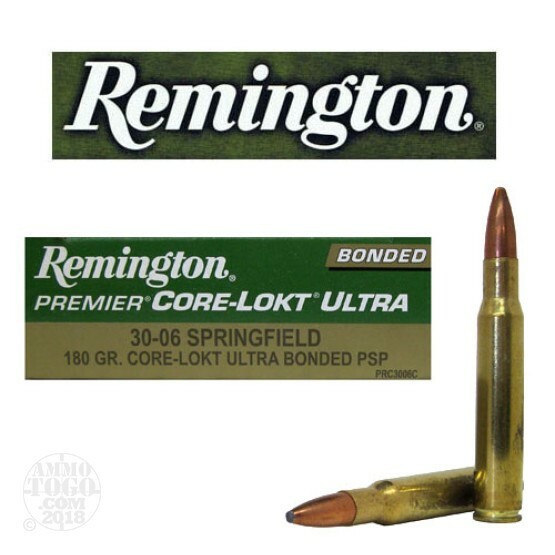 This package contains 20 rounds of Remington Premier Core-Lokt Ultra .30-06 Springfield ammunition. Each round is loaded with a 220 grain bonded pointed soft point projectile. The bonded construction of these world-class bullets deliver 95 percent weight retention and controlled mushrooming up to 2 times the original diameter. The result is hard-hitting terminal performance and a massive and devastating wound. This ammunition is factory fresh, non-corrosive, boxer primed, and features reloadable brass cases. Leaving the muzzle at a velocity of 2700 feet per second with 2913 foot pounds of game-dropping energy, use these rounds for hunting everything from whitetails to moose.